The fifth year of the SCCUL Enterprise Awards, an initiative of SCCUL Enterprises Ltd aided by Ballybane Enterprise Centre and St. Columba’s Credit Union is due to commence on Thursday the 29th January 2015. Winters Property Management are proud to be the main sponsor this year for these awards. 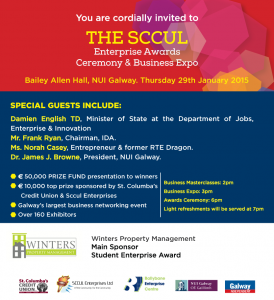 The 2014 SCCUL Enterprise Awards Ceremony will be hosted by NUI Galway and the ceremony will take place in the Bailey Allen Hall in NUI Galway. The SCCUL Enterprise Awards Business Expo will run in conjunction with the awards ceremony and all entrants in the SCCUL Enterprise Awards are invited to attend. The 2014 SCCUL Enterprise Awards has a prize fund of over €50,000 which will be divided among the overall winner and category winners. The overall winner of the SCCUL Enterprise Awards will receive a cash prize of €10,000 sponsored by St. Columba’s Credit Union Union and SCCUL Enterprises, a specially commissioned trophy, and a promotional package worth €2,500 (comprising a two page business profile in a SCCUL Enterprise Awards souvenir pull out supplement in the Galway Independent). The overall winner will be selected from amongst the winners of the six categories.